Bardstown, KY (April 25, 2018)– The Bardstown Bourbon Company (“BBCo”) achieved another major milestone today with the installation of its second 50-foot tall, custom made, 36-inch stainless steel Vendome Copper & Brass Works still. Delivered in one piece and hoisted above the 55-foot still tower by crane, the Vendome apparatus was lowered into the center of the building. The new still installation marks the second expansion for BBCo since it began operations in September 2016. 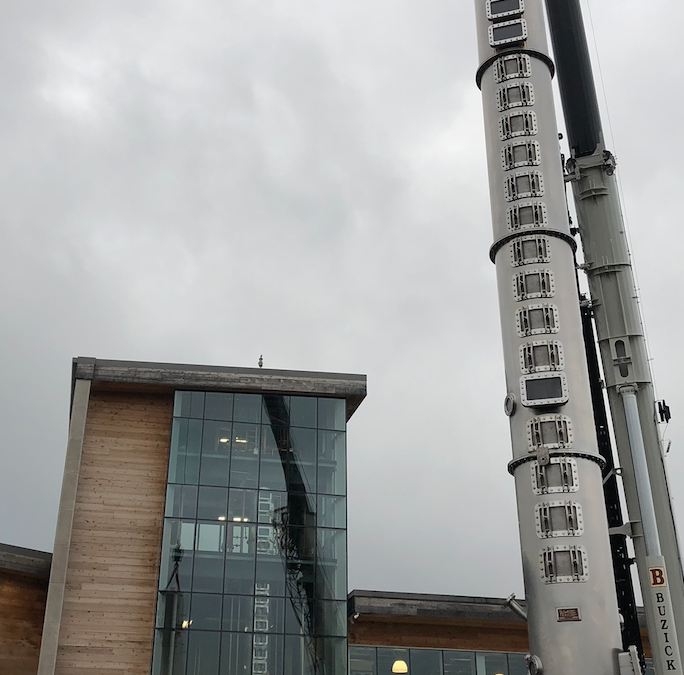 The still will be connected to Bardstown Bourbon Company’s new, 7,500 square foot fermenter building, which houses sixteen 12,500-gallon fermenters, a second laboratory, and an employee break room. The building will also be the future home of an expanded barrel dumping facility. BBCo anticipates the latest expansion will be complete by July 2018. BBCo’s Collaborative Distilling Program is a unique model in the American whiskey market. This first-of-a-kind service provides craft distillers, non-distilling brand owners, and existing brand owners the ability to: (1) work side-by-side BBCo’s production team to create their own authentic and innovative Kentucky whiskey, bourbon, and rye products and mature them onsite;(2) ensure consistent, high quality production that can rapidly scale; (3) control the future source for their product; and (4) provide a production location and environment that they can celebrate and promote. The exclusive program is limited to companies that qualify under BBCo’s stringent eligibility requirements. Program partners must have exceptional brands and/or only want to produce superior quality whiskey. Moreover, BBCo restricts the number of brands in order to provide the highest level of customer service. With the latest expansion to nearly 7 million proof gallons, BBCo will be turning nearly 70 fermenters a week and produce more than 24 different mashbills in 2018. To continue to meet production and technical demands, BBCo is expanding its highly-experienced whiskey distilling team, creating a dedicated quality control and lab technician team, and further upgrading its distilling technology. BBCo’s distilling team is led by Bourbon Hall of FameMaster Distiller, Steve Nally – a 40-year veteran of the spirits industry and the former Master Distiller of Maker’s Mark, and John Hargrove, Executive Director of Distillery Operations, formerly Master Distiller and Distillery Manager, at Sazerac and Barton Brands 1792. With more than 40 production employees, the team has an average of more than 15 years of whiskey making experience, working with world-class distilleries, including Jim Beam, Maker’s Mark, Barton Brands,Diageo, and Michter’s. Construction for the distillery expansion is led by Buzick Construction of Bardstown, Kentucky, which built the distillery, expanded it to its current three million proof gallon capacity, and constructed the three 22.5k barrel warehouses on the property. At the current production rate, BBCo will build more than two-and-a-half 22.5k barrel warehouses per year. The Company plans to start construction on its fourth barrel warehouse in the summer of 2018. In addition to its Collaborative Distilling Program, BBCo is also developing and releasing its own brands and opening a destination experience with a unique visitor’s center featuring a full-scale restaurant, bar, vintage spirits library, and transparent educational experience. The Company anticipates announcing an opening date for its visitor’s center in the very near future. 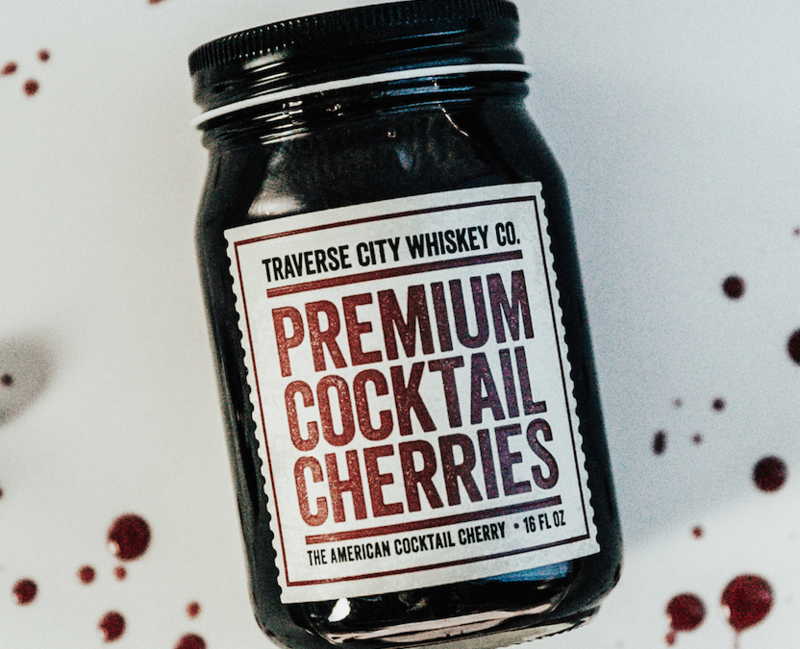 Traverse City, MI (April 3, 2018)– Traverse City Whiskey Co.(TCWC),the portfolio of premium whiskies and bourbon made in Michigan, today adds all-natural Premium Cocktail Cherries to its lineup. Known as the “Whiskey of the North,” and based in the “Cherry Capital of the World,” TCWC is proud to partner with regional supermarket chain Meijerfor distribution of the new brand in its various U.S. retail locations. TCWC Co-founder Chris Fredrickson chose to use Northern Michigan Balaton Cherries,which are harvested exclusively from orchards in the Traverse City area. The large, plump, firm cherries, which are dark burgundy in color, are delivered to the distillery in five-gallon pails that also contain a natural syrup base that acts as a buffer to protect the fruit from smashing together. The syrup is mixed with Traverse City Straight Bourbon Whiskey and brought to a boil, while the Balaton Cherriesare heated to a near-boil, in nearby copper pots, before jarring. Once the premium cherries are jarred and weighed, they get backfilled with the boiling syrup, which has burned off all of the alcohol during its slow-cooking process. The TCWC team prides itself on traditional jarring methods, better known as the “hot-filled” process, which kills all possible bacteria. The perfect garnish for cocktails, like an Old Fashioned or Manhattan, or an ideal topping on desserts, these unique and flavorful premium cocktail cherries are all-natural and gluten free. Each 16oz. jar has a shelf life of two years and contains approximately 70 cherries. TCWC Premium Cocktail Cherries are one of the only cocktail cherry products both grown and jarred in the United States. TCWC Premium Cocktail Cherries will be available at all Meijer locations for a suggested retail price of $15.99, and select off-premise accounts in Michigan, Ohio, Indiana, Illinois, Wisconsin, Kentucky, Washington DC, Maryland, Delaware, Florida, Texas, Nevada, Arizona and California. Retail prices may vary by market. company draws upon its early family roots in the distilled spirits industry dating back to the late 1800’s, sourcing all grains from the Midwest. Traverse City Whiskey Co. is a proud member of the Distilled Spirits Council of the United States(DISCUS).